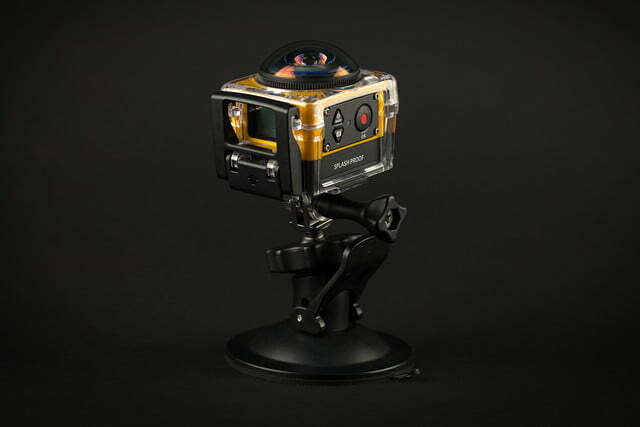 Panorama cameras like the SP360 are preparing us for a new way of viewing videos and photos in the future. If you love Google Maps’ Street View feature, and would like to capture similar 360 panoramas, you could find some way to procure a Google Street View camera or design a complicated array of cameras (good luck on both of those). 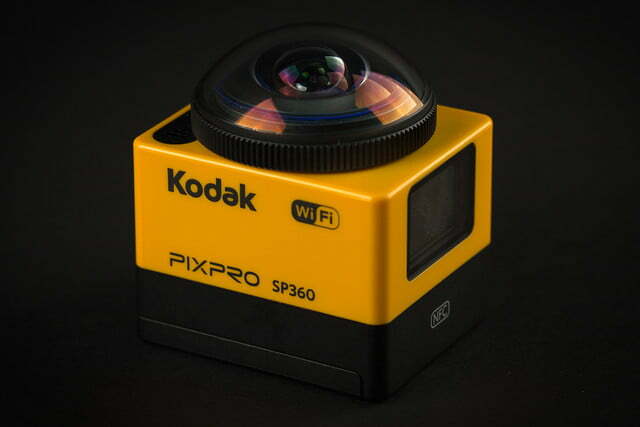 Or you can pick up a 360 camera like the Kodak Pixpro SP360. 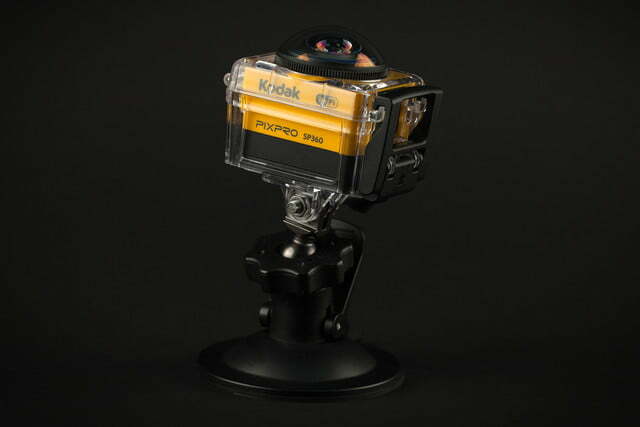 The Pixpro SP360 ($300) from JK Imaging — a company that licenses the Kodak name — is one of the first consumer cameras made for shooting 360 panorama videos and photos. 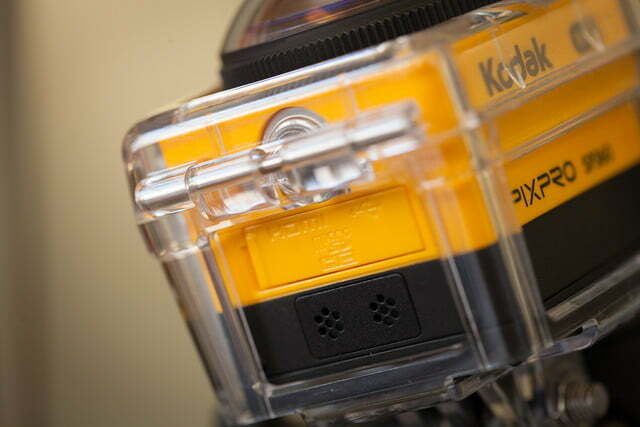 This action cam is easy to use, and it gives you an experience most other cameras can’t. 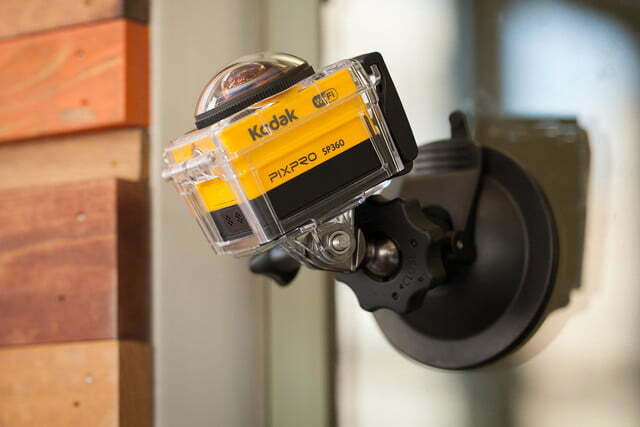 There are practical uses too: Real estate and travel agents, for example, could use the SP360 to create a 360 video of a house or hotel they are trying to sell. But being a first-gen product, it has issues with image quality. Is a 360-degree experience worth sacrificing quality, or is it still too early of a technology for consumers to embrace? The answer is a bit of both. 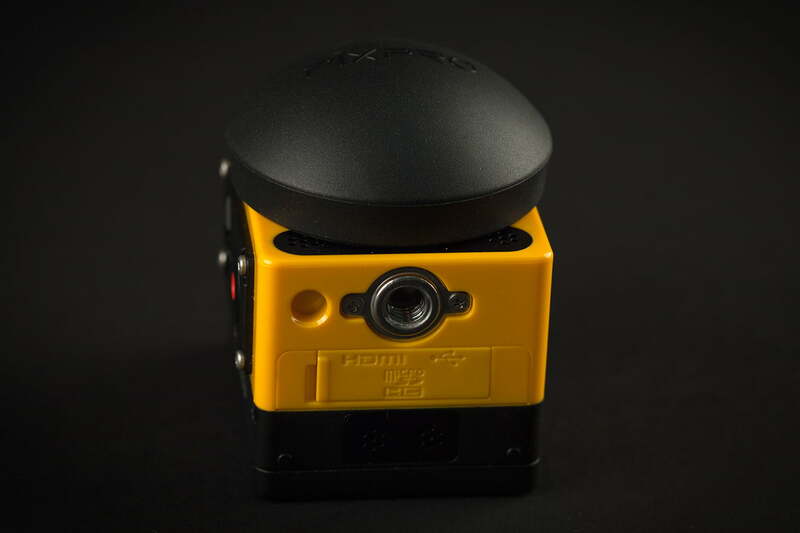 Spherical cameras come in many different shapes and sizes, but the SP360 has a conventional boxy design, over than a domed top. 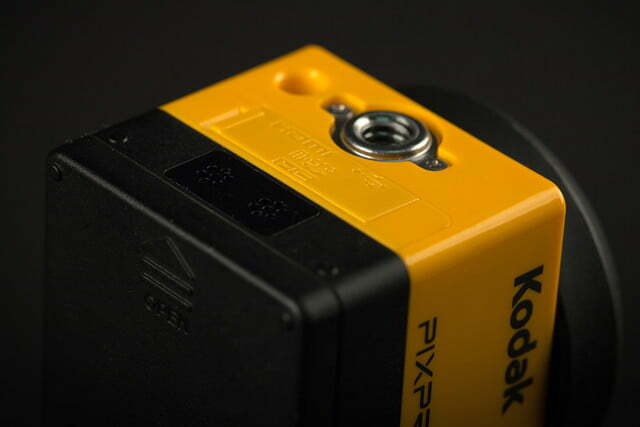 Weighing 3.6 ounces and measuring approximately 1.6 × 2.0 × 1.5 inches, the camera is lightweight and compact. 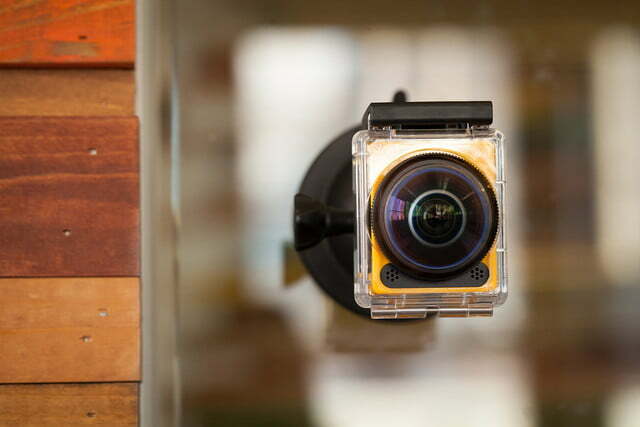 Inside are a 16-megapixel sensor and a 214-degree ultra-wide-angle f/2.8 lens that can shoot 360-degreet horizontal panoramas; it can shoot part of the vertical view that isn’t blocked by the camera base. 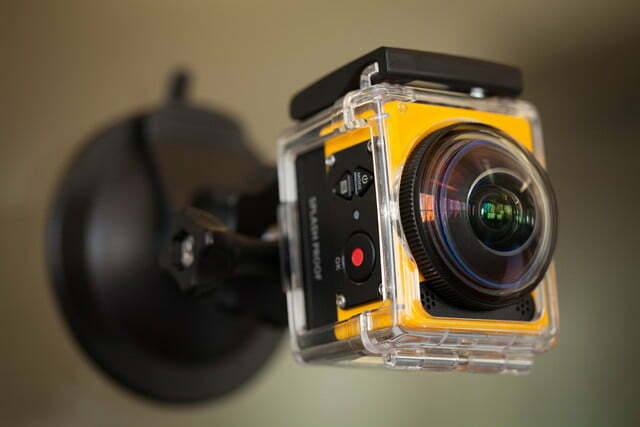 The sensor can record video up to Full HD 1080 at 30 frames per second (fps), but that’s for a typical 2D view. 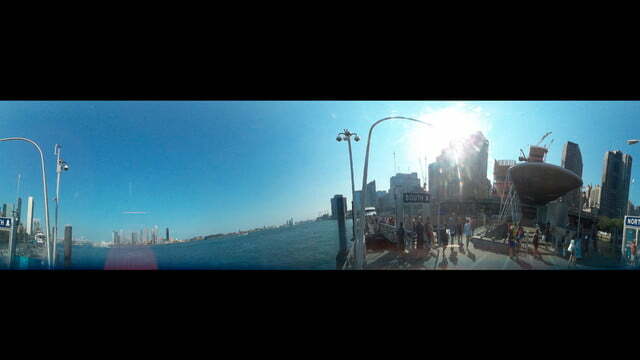 The maximum resolution for 360 panoramas is 1,440 × 1,440 at 30 fps. 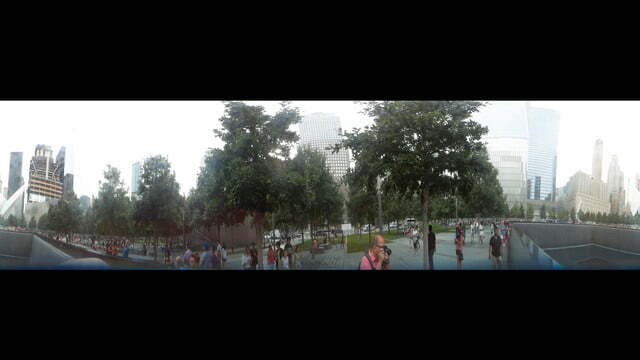 Panoramic still photos have a max resolution of 10 megapixels, and the camera is able to shoot bursts of 10 fps. ISO sensitivity is 100-800, so it’s not exactly a low-light performer. There’s also Wi-Fi and NFC for remote operation and sharing to mobile devices. 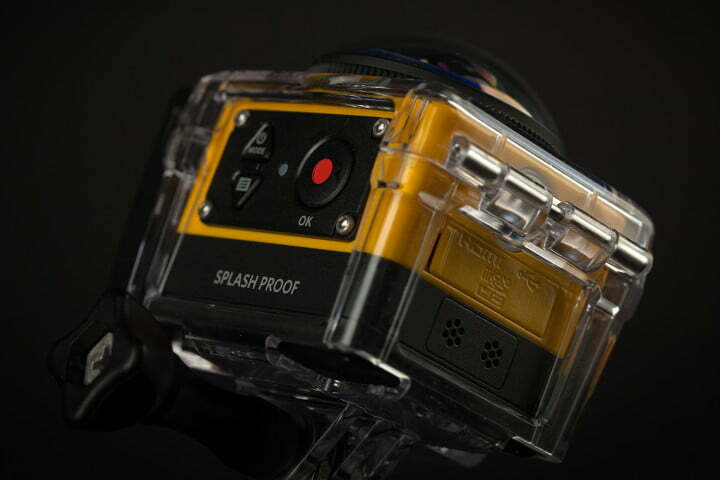 Since it’s designed to be an action camera, the SP360 has some rugged attributes. It’s dustproof and water resistant (not waterproof), shockproof from a drop of 6.6 feet (2 meters), and freezeproof down to 14 degrees Fahrenheit (-10 degrees Celsius). 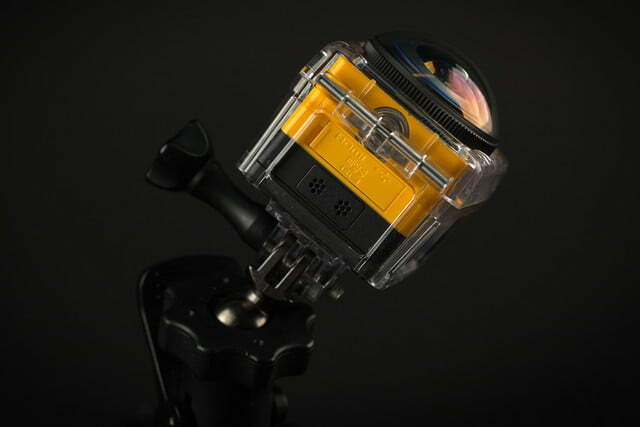 JK Imaging offers in the Extreme Kit ($400 MSRP) and Aqua Sport Kit ($350 MSRP) a waterproof housing ($55 alone) that lets you capture some unique underwater shots or offers extra protection during water activities. SP360’s trump card? Support from YouTube. As for mounting options, JK Imaging offers a variety that covers the basics (available separately or part of the kits). 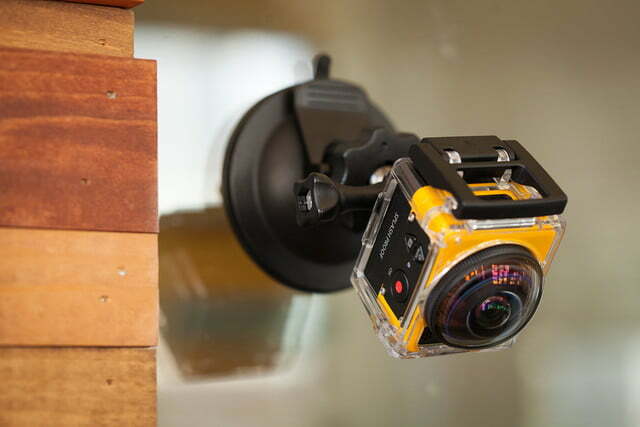 It’s not as extensive as those for GoPro or Sony cameras, but the SP360 has somewhat of a similar mount design as GoPro, so we were able to attach the SP360 to some – not all – of our GoPro accessories. 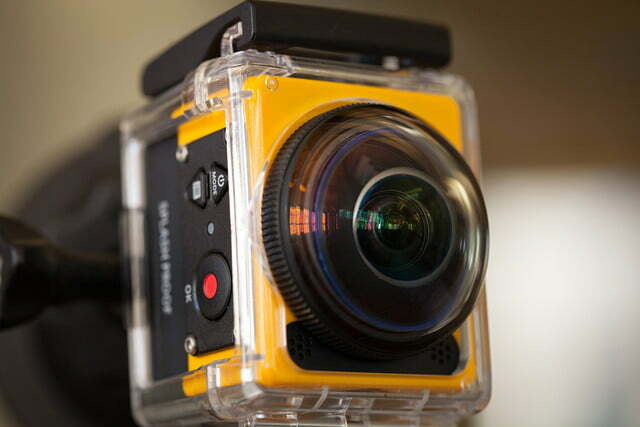 On top of the camera is a removable glass cover that protects the lens. On one side, you’ll find a small, monochrome LCD that shows status and lets you adjust settings. Below the LCD is the NFC tag for quick pairing with select Android devices. On another side are buttons for controlling the camera. There’s a video record/shutter button, up-direction/power/mode button, and down-direction/menu button. There’s also an LED that comes on when you’re recording. Turn the device to yet another side and you’ll find two microphones, tripod screw, speakers (used only for beeping alerts), and a cover for the memory card slot, USB port, and HDMI-out connector. At the bottom is a removable cover for the battery slot. 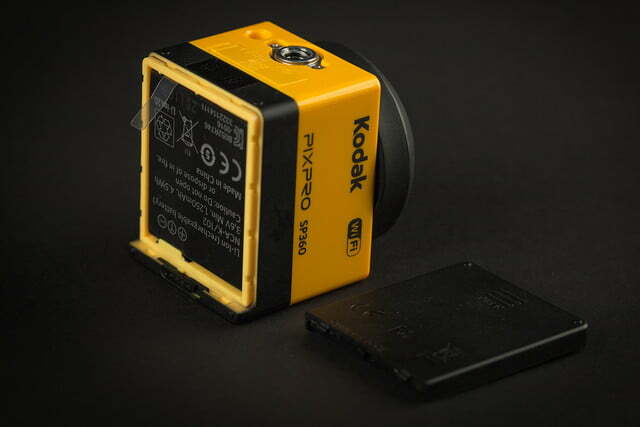 The battery can be charged in-camera or with the external charger. 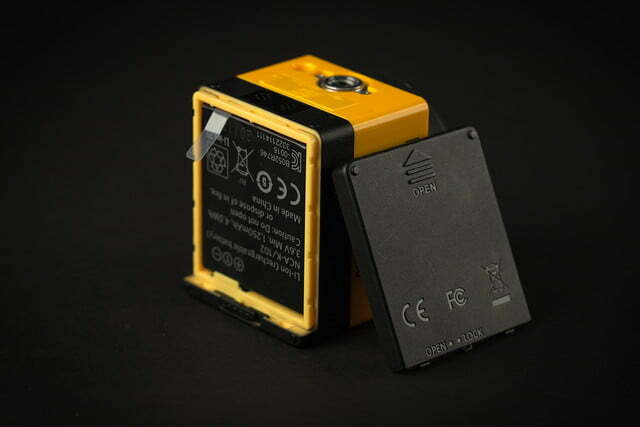 Like all action cams, the SP360 has a limited-capacity battery that’s rated for 160 minutes. We achieved about 1.5 hours of continuous use (with Wi-Fi on and off), although you can get a bit more during casual use. We tested out the Explorer Kit ($350 MSRP). 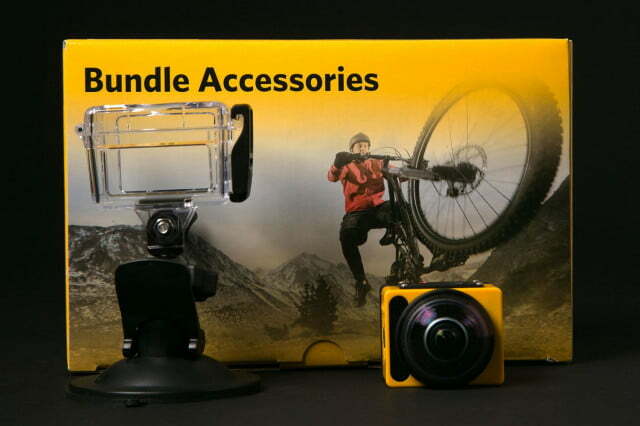 Besides the camera, the kit includes a standard housing and a waterproof housing, handlebar mount and a suction cup mount, extended arms, a head strap, two vented helmet strap mounts, adhesive mounts (including one for surfboards), a quick clip, a battery charger and a battery, an AC adapter, a Micro USB cable, protective covers for the lens, a carrying case, a cleaning cloth, and some documentation. It’s a decent package. JK Imaging provides a standard one-year limited warranty. 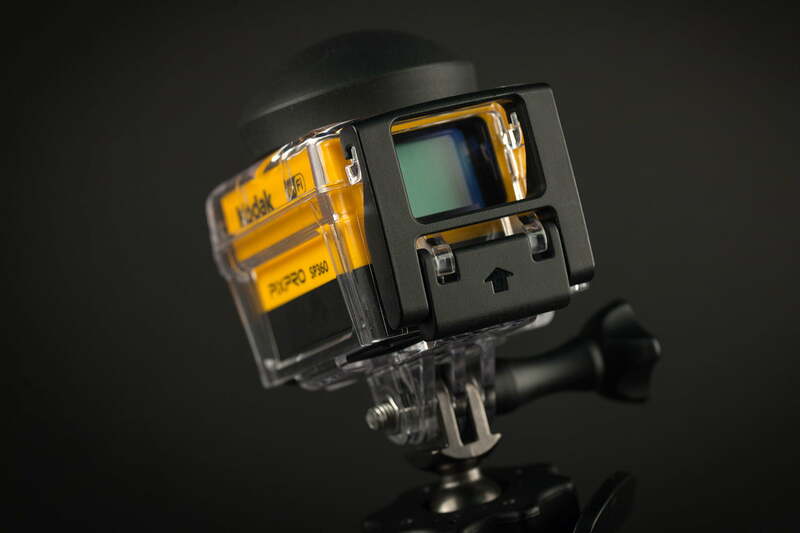 Like any action cam, the SP360 is easy to use right out of the box ­– simply turn it on and start shooting. When you power it on, it automatically enters Wi-Fi pairing mode (there doesn’t seem to be a setting to turn this option off). You can use the SP360 independently, but you just need to exit out of the Wi-Fi pairing screen. The camera does like to make lots of annoyingly loud beeps, which, luckily, can be turned off or softened in the settings menu. In the other modes, you can change the resolution, the different panoramic views (like dome, sphere, two 180-degree split screens; regardless of what you pick, the change isn’t permanent and can be adjusted in playback), etc. Of course, for any device with a small LCD, changing settings requires drilling through various menus and sub-menus. One wrong button press and you’ll have to start over. 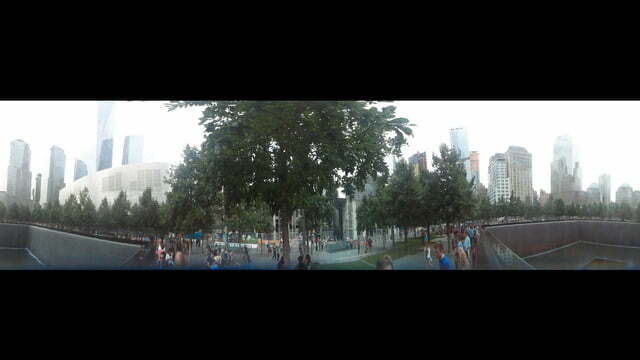 Also, the camera doesn’t retain your settings after you turn it off. We did find the process becoming more intuitive over time, but it is far easier to control the camera with an iOS or Android device. 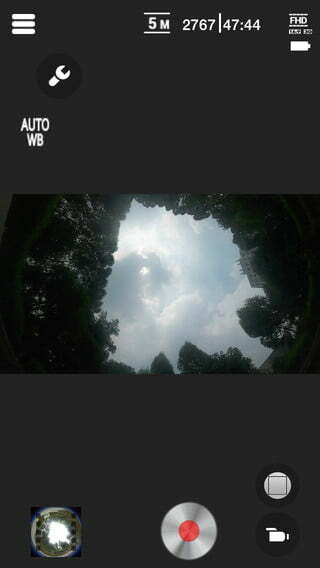 Besides letting you easily adjust settings, you get a stable live view of what you’re shooting. 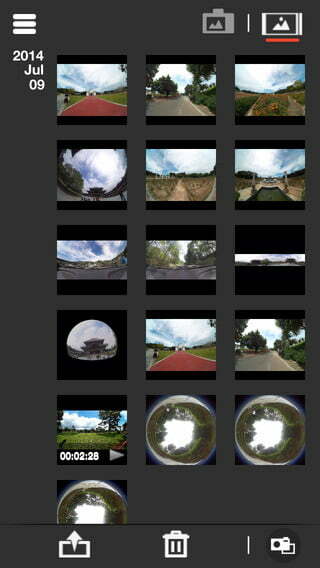 You can also see the various unfold modes (dome, segmented, ring, and panorama) in action. For an app, it worked really well and we didn’t have any issues connecting the camera to our smartphone. The point of 360 panorama cameras is to capture an immersive experience; you aren’t just shooting what’s in front of you, but also above, to the sides, and behind. If you’re snowboarding down a mountain, you’re not only capturing the ride down, but also your fellow snowboarders behind you and the scenery surrounding you. 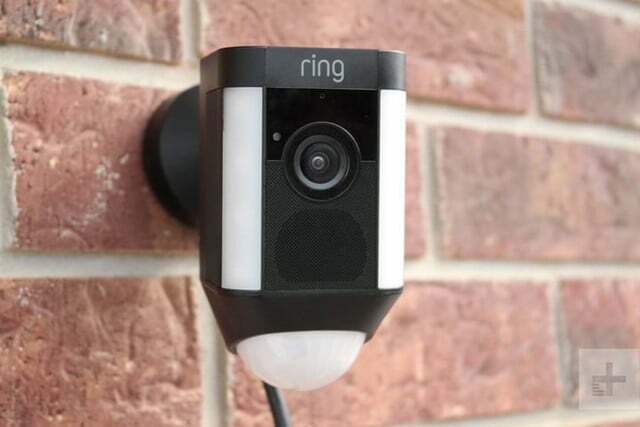 And it’s not just action shots: Imagine walking through Times Square as a tourist and recording the surrounding lights and sounds – these are fun vacation cameras, in other words. In playback, the viewer can pan around the scene as if he or she is right there next to you. Whether it’s a motion video or a stationary image, the ability to add an additional experience to your photos and videos makes these cameras fun and unique. 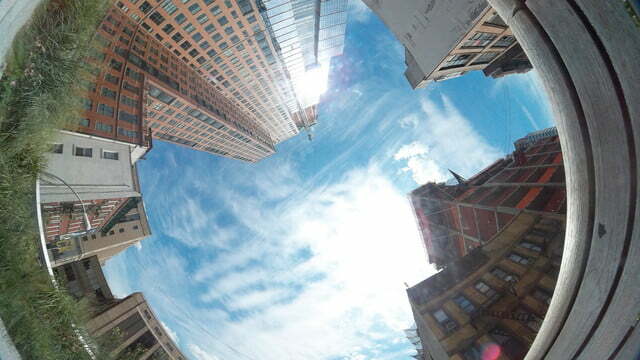 Note, however, that you aren’t getting a true 360-degree spherical experience. 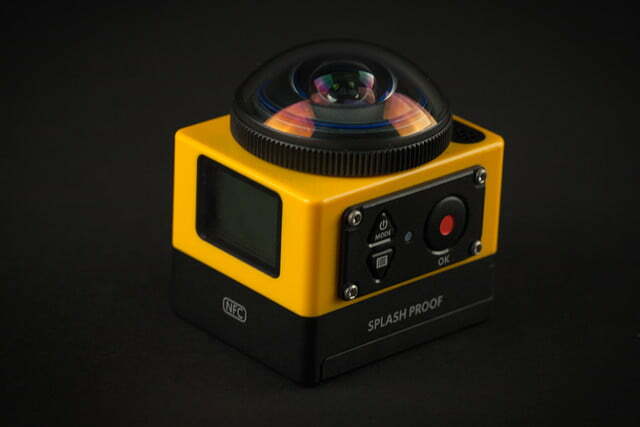 Because of the camera’s design, it doesn’t capture a complete 360 on the vertical axis. But, like the V.360 from VSN Mobil, the SP360’s image quality demonstrates that consumer 360 cameras are still in their infancy. 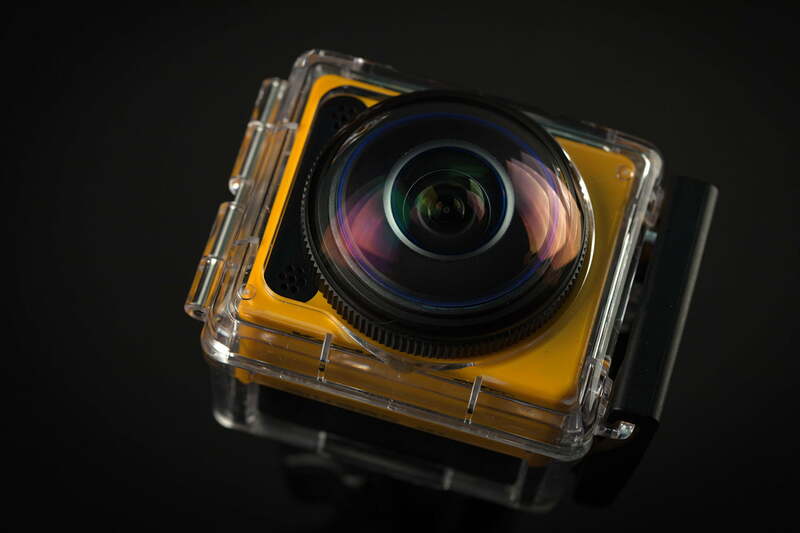 The SP360’s videos are relatively smooth, but the color reproduction isn’t accurate and the quality isn’t as sharp as a standard camera or action cam from Sony or GoPro. You’ll notice purple fringing and other artifacts. As Jonas Pfeil, creator of the Panono panoramic camera told us, 360-capture devices like the SP360 are trying to do a lot with a single sensor and lens, and image quality will always be an issue. Look at the SP360 as a secondary camera to bring along for capturing a unique point of view, not as a primary camera — unless you aren’t too finicky about image quality. 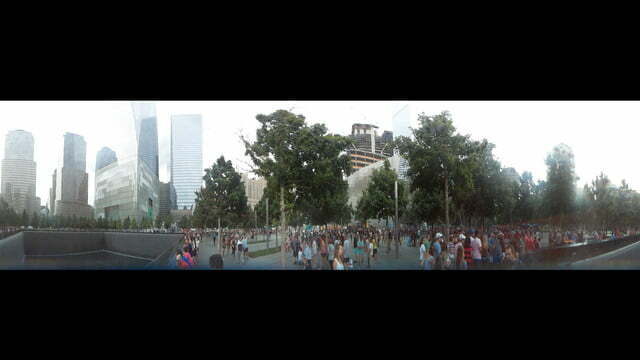 Recorded audio is good, but it couldn’t cut out strong wind noise completely. 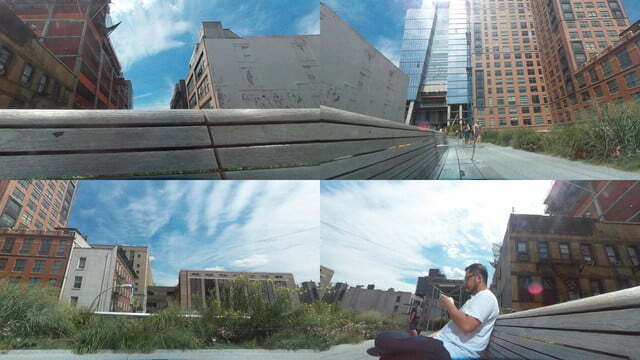 Another problem with 360 cameras is playback: How do you view your images and videos in full panorama, and how do you share with others? When viewed or shared as a regular JPEG or MPEG on your computer, it’s still a 2D experience – a bad one at that, because the image is either broken into two 180-degree segments or a warped panorama that’s headache inducing. You could play back content through the Pixpro app or desktop software, but it’s not convenient. How to view a 360 panorama is an inherent issue with these nascent cameras, but the SP360 does have a one-up over the competition: YouTube. 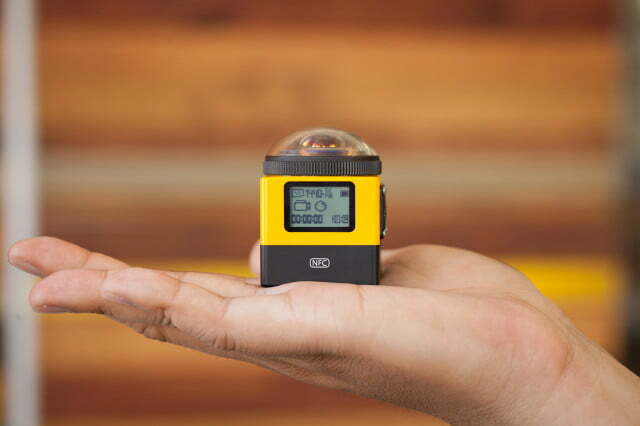 Along with the Ricoh Theta, Giroptic 360cam, and IC Real Tech Allie, the SP360 is currently just one of four panoramic cameras YouTube supports. When viewed in Chrome, Opera, or Firefox browsers, users can interact with the video by panning around using the onscreen controls. It’s still a 2D experience on a computer monitor, but it’s a good way to watch and share this type of content. An even better experience is on a mobile device: Using the YouTube app for iOS or Android, in full screen, you can physically pan around a video or image by moving the device around you. If you have a Samsung Gear VR headset, it’s an even more immersive experience, although the low resolution might make you sick. Uploading content to YouTube isn’t difficult, but there is a process to follow. First, you need to make sure you are running the latest firmware and newest (beta) version of the desktop software. The software not only lets you review content, but it prepares a video for YouTube. Once a file is processed, you’ll need to send it to the 360 Video Metadata software and resave it as another file (YouTube requires certain information in the file in order to display it as a 360 video) that you upload. The process is far easier than it sounds. Note that all this conversion work lowers the resolution in the end. YouTube will only let you upload videos. 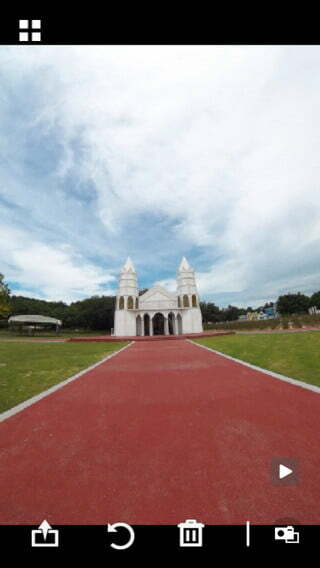 For photos, there are a few sites that host 360 panoramas, like Google Maps’ Photo Sphere. As for where to mount the camera, you could hold it in your hand, or attach it on top of your head or on top of a telescoping stick. 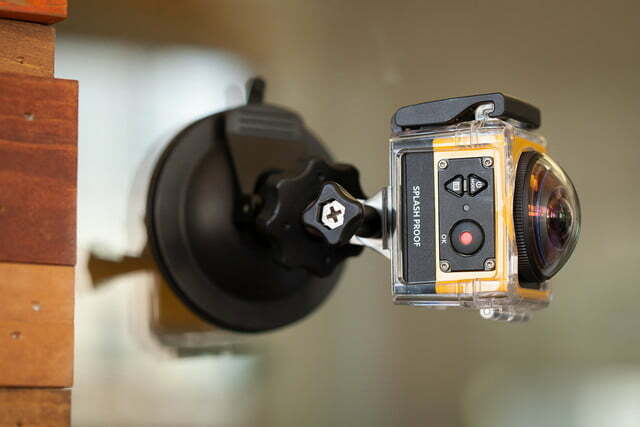 You’ll look silly, but it’s the best way to capture a 360 view. Strapping it to your body limits the view you can capture. Overall, the SP360 is easy to use and the quickest way to record 360-degree content without having to set up complicated rigs, but like the V.360 it suffers from image quality issues. The SP360 is all about capturing the experience of the moment, and for activities or travel, it’s a nice secondary camera to bring along. 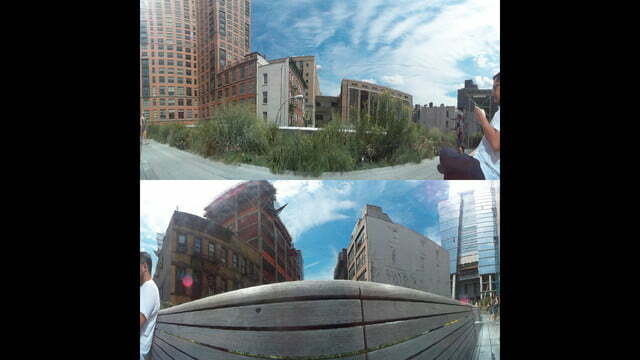 Selfie sticks may be frowned upon, but to capture a good 360 panorama, it’s more effective to hold the SP360 above you. 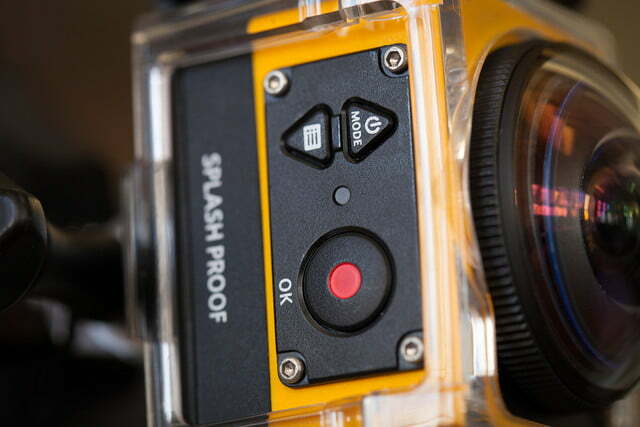 If you don’t buy one of the kits, add this waterproof housing for a new perspective in underwater shots. This case has room for the SP360 and accessories, and it’s water resistant. We like the SP360 over the V.360 due to a better app, more settings options, usable desktop software, and, perhaps more important, support from YouTube – which helps to legitimize this trend. The ability to view and share the content is a big issue with these cameras, and being able to upload to YouTube is a great advantage. 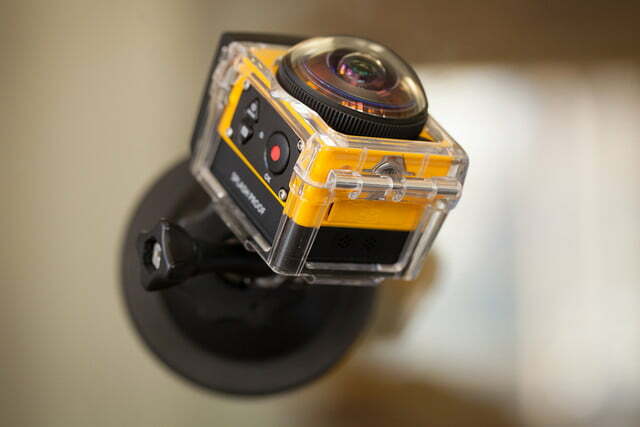 First-gen 360 cameras like the SP360 are all about fun. It’s difficult not to acknowledge the low image quality, but it’s OK when viewing on your computer monitor or a small smartphone screen. It’s an issue when you view it on a large HDTV or emerging VR headsets like the Oculus Rift. VR headsets require very high-resolution content, otherwise the viewer could feel sick while trying to experience it. 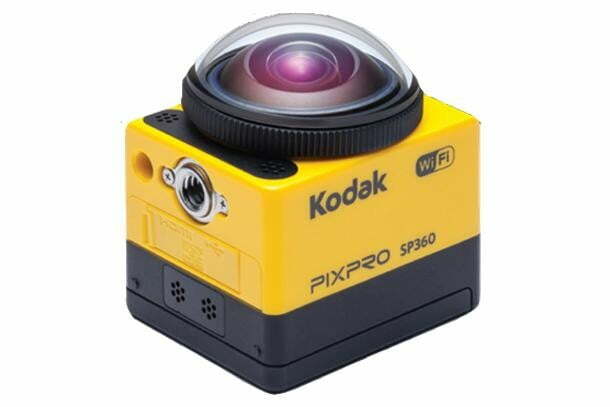 The SP360 isn’t capable of creating content for this emerging technology, but it is preparing us for what will be a new way of viewing videos and photos — a future we find very enticing.